I got this great award from the wonderful J. Kaye of J. Kaye's Book Blog. I can hardly believe that there is anyone who doesn't know J. Kaye! She is a prolific book reviewer, a great host of book challenges, and generous with giveaways. And her entire family reads and reviews! Don't miss her blog. The Humane Award is to honor bloggers who are kindhearted individuals. They regularly take part in my blog and always leave the sweetest comments. If it weren't for them, my site would just be an ordinary book review blog. Their blogs are also amazing and are tastefully done on a daily basis. This award is to thank them for their growing friendships through the blog world. I am blessed to know many bloggers who deserve this award. I'm going to pass it along to three readers who are not from the United States. Jill from Rhapsodyinbooks's Weblog passed this super award along to her fellow Game On dieters. If you haven't been to Jill's blog, you're missing out on some great reviews, articles, giveaways, and more. Seriously, go and read. Shanyn from Chick Loves Lit Also gave me this award! Visit her blog for terrific reviews and giveaways. Another blog to add to your daily visits. What are some of your favorite foods or flavors? Congratulations on your awards! You chose some lovely bloggers to pass them on to. Congratulations on the award! Thank you so much for passing it on to me! I found your list of seven favourite foods interesting - no mention of chocolate! Probably the main reason I'd be terrible on a diet! 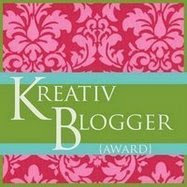 I just realized I forgot to notify blogs that I gave the Kreativ Blogger award to... oops! I love all things lemon too. Plus, I'm a huge risotto fan! I make my grandma's old tomato risotto recipe that my great-grandma used to make. That is so funny that you named all food things! Has the diet got you thinking of food a lot? Congratulations on your awards! Favorite foods: chocolate (duh), anything with ginger, cinnamon and vanilla, apple, croissants and thai food. Home made green chili pizza with pesto risotto and fruit salad, with lemonade and spice cake for dessert. Way to go on the awards! As I think we have discussed before, I too love risotto. I could eat it 7 days a week!!! A dieter's thoughts always turn to food. lol I've never heard of grilled pizza but it sounds delcious. Congratulations on your awards. You deserve each one. Congrats on your awards! Risotto's one of my favorites, too...but I don't think it's on the Game On! diet, is it? :( Guess I'll have to save it for my off days! Congrats on your awards, Beth! Homemade pizza, cheesecake and lemonade makes my day! Congratulations on your awards! And thank you! I enjoyed your seven favorite things list. I wish you lived close by - my husband loves to make risotto! I have an attachment to these risotto balls that I once had in New York. Crunchy on the outside and filled with cheese and rice. congrats on the awards...I thought I was the only one that liked Spice Cake!